I am selling a strategy that took me just about a year to develop, code, and put together. This strategy has never returned less than 69.5% ITM on any given day, and the average ITM for the past 4 months of testing has been 81.2%. 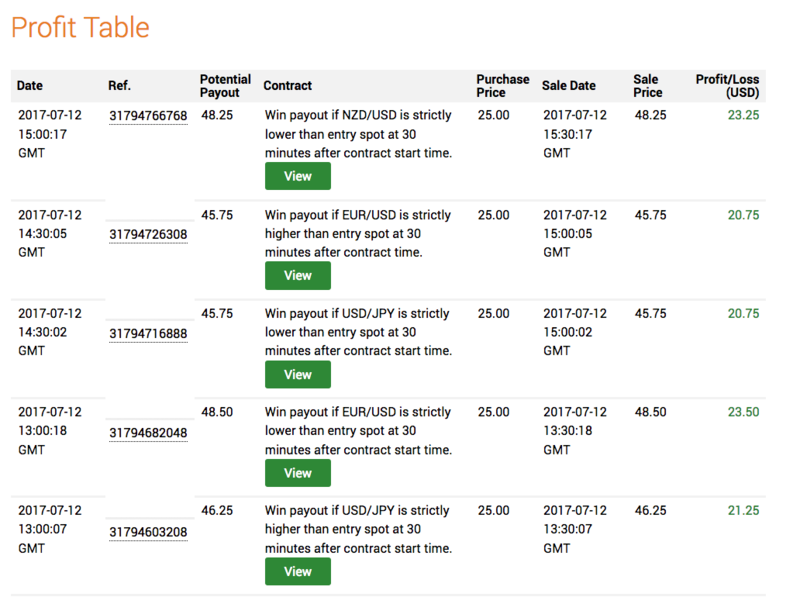 Dynamic payout. Default: yes. Adapts the stake depending on the return rate, so you always get the same payout. Smart forecast. Default: yes. Highly recommended. It is one of the key elements of the algorithm which allows high ITM. Profit stop. Default: no. Set a daily profit limit, the program stops if profit reached. Number of trades per session. Default: 5. Profit per trade. Default: 25. Expiry. Default: 30 mins. Minimum is 5. Maximum is 1 hour. The higher the more accurate. Here are for instance the results of yesterday and today, with the default settings. Profit of yesterday has been 62.5 and today just finished at 109.5. Why am I selling this package? Because it took me a lot of time to develop, and I don’t make hundreds of thousands of dollars off binary options, like all these fake online scams. I make real, descent money. I average 70 a day, 5 days a week, 1400 a month, with my program. Since I worked a lot on this program, making a bit of extra income for it is well deserved. As mentioned before it is fully coded in python, and uses various libraries which will be automatically downloaded through the installation process. It uses a mix of indicators and forecasting based on news. For the actual trading, it simply works wit the excellent binary.com api. It works both in live and demo. It runs on mac and windows, no problem. Python works on both machines, and the installer simply detects your os to download the requirements. You can choose all your options. It’s super simple, the options are just stored in config file. Just edit it with notepad or any text editor, save, and you’re good to go. How much can I expect to make with your program? It all depends on your initial investment. As you see, I “only” make 70 a day on average. That’s because I trade with a payout of 25 and only 5 trades a day. This is extremely safe and so it makes money. If you want to get a bit more risky, you can increase the number of trades per day, and/or your price per trade. If you quadruple what I do and stay at 5 trades a day, you can look at 240 a day. But then you need a bigger starting capital. My constant minimum balance is 1000. Yours would be 4000 for 240 a day on average. What if I don’t make money with your program? That is extremely unlikely, but if you somehow do not generate profit from my program, send me proof of failure, and I will pay you back right away. My program costs 100€, via paypal. 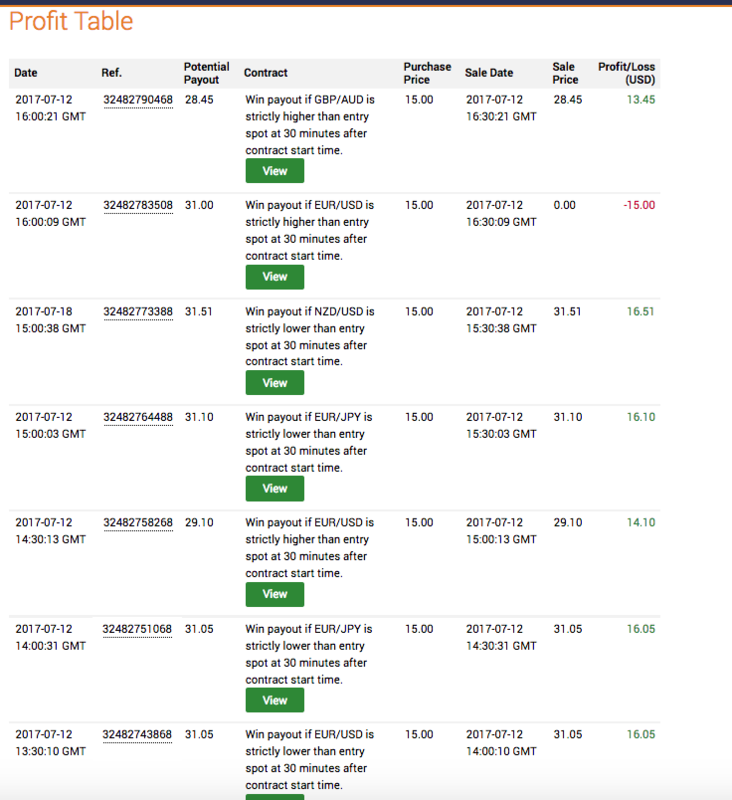 It’s really nothing, you will triple your investment in one week just with the default settings, and if you don’t make money, you get your 100€ back. If interested, you can PM me or request here on this thread. I will send you my paypal address, and I will send you the files in a .zip, right after your payment. If you have any trouble installing the software, feel free to ask me for help, I will give you my mail address. Thanks for reading, PM or request here if interested! Just posting here to show hesitant people that it works. I paid, got my software a little bit late I have to say, like 48 hours after payment. Then I turned it on, configured it, and it works so far. Little more info on my config: I run the latest Windows 10, I didn't have any problem with the installation, if you follow the instructions it goes smoothly. MarceloPagnol told me it works with MacOS as well, since Python runs on all platforms. I haven't had a chance to try though. As for the app settings: I changed the trade amount to 15, cause that's what I can afford for now. 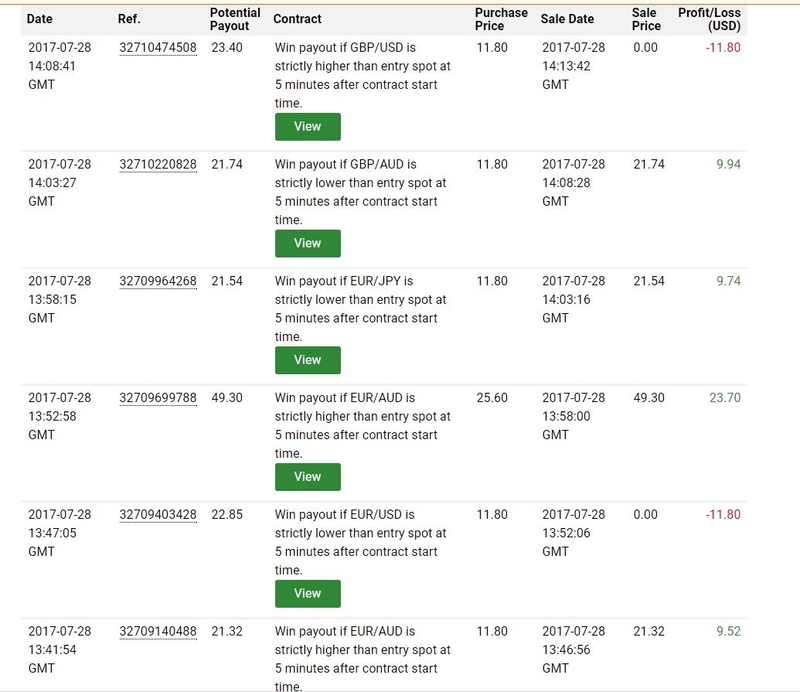 I changed the maximum number of trades per day to 100, and just stopped when I was happy with the profit. I ran it during the London/NYC overlap. I think that's it. Oh yeah also I disabled martingale by setting the martingale loss limit to 1. With this ITM ratio you really don't need martingale. I will post the results of today if asked. I got my software last Thursday, I have been running it ever since, and it works great so far, only profit. I have nothing to complain about, thanks for the software MarceloPagnol! Don't hesitate if you have questions, I'll be happy to contribute! @Pelourinho good if like please share this software with us as demo, then we will buy this software. I don’t think there is a demo version. You just have to pay, get the software and see for yourself. Also you get your money back if you’re not satisfied, which is not my case and I don’t think will be yours. @mnaseem hey there! Pelourinho is right, there is no demo version. Just purchase the software and see for yourself. If you're not satisfied, you're reimbursed through paypal. Guys do yourself a favour and stay away from this software. This Marcelo guy is a FRAUD. I sent him money via paypal on JULY 14 and now almost 2 weeks later i still have no software and have not heard from the guy. He tried to give me some python script that asked me for my paypal email address and PASSWORD. He said it was for payment confirmation like really....WHO asks for someones paypal password. This guy is a thief and a fraud and I'm going to file a dispute with paypal regarding this guy because he is a huge scammer. When i purchased the software he told me because my computer is windows he is going to take 48hrs to send me the file this was like 3 days after not hearing from him then he said if i wanted the file for windows quicker I should pay him another $30 dollars which i refused this guy is a scam artist and we all know that @Pelourinho is probably a FAKE account he created just to try and get other people to fall for his SCAM of a software. STAY AWAY FOLKS IF YOU WANT TO KEEP YOUR MONEY SAFE THIS GUY IS A FRAUD 100%!!!!! UPDATE: Marcelo has now sent me the script and I have successful run it so far so good will post my results later tonight but looks promising. I take back my comment i guess he is just extremely busy to reply quickly but nonetheless my only fault with this product is that the seller takes a long time to reply and it took me almost 2 weeks to receive the product. I have now received it and I'm testing it and will update with my results. This may turn into a positive review yet we will see I apologize for being frustrated with him but I think when you buy something you should receive it at least within 48 hours. Thank your for correcting your review. I do have a couple orders to deal with and it’s indeed not always easy to deliver in time, but all my clients are satisfied with the product. Don’t hesitate to ask more questions if you have any. @zezefaith yeah the paypal verification thing was a bit of a bummer but I didn’t have any problem with it and now I hear MarceloPagnol removed it. So no more issue, really good software! And I agree with you he does take a bit too much time to deliver, but if he has a lot of orders it’s normal I guess… Totally worth the wait and money though, so far only profit for me. UPDATE: Here are my results 4 WINS 2 LOSSES (66% ITM) NOT BAD AT ALL. 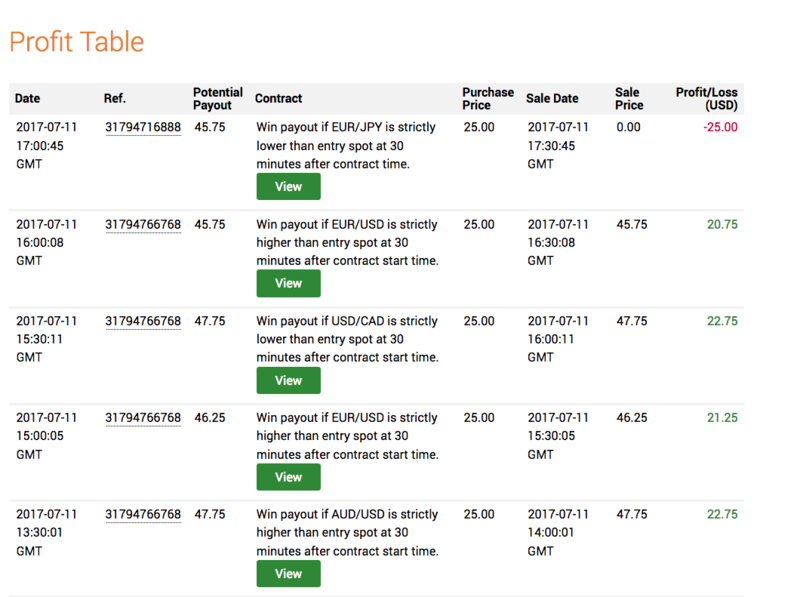 I use the martingale feature to recoup my losses so that i am in profit. I guess the future results will speak for themselves, if you still have questions do not hesitate. And tell me what you think of this video @pierredemarque ! Well yes as I mentioned to you via PM, I only set it to 1min to avoid having a 30 minute long video. You asked me to show you the bot working just for a couple minutes to not have a video that's too long. But you can choose the expiry in the configuration of course, and the recommended expiry is anything longer than or equal to 15 mins. I can send you one with a 30 min expiry it's just that it will be super long. It's just that with 1 min the accuracy is lower, but it also works. @MarceloPagnol I would be interested too, in the bot, however I'd feel alot more confident if you could use a site if you don't have one whereby you pay via paypal and you get an instant download (e.g. https://sellfy.com/) rather than just pay yourself and then hope/await for when you send the files? Would that be something you would consider, also you can use an email to be send to authenticate the user if that would work? Let me know your thoughts? also you can use an email to be send to authenticate the user if that would work? I'm afraid I don't understand the question. You want me to send you an activation email? I did research the sellfy option, it does seem super convenient and simple. So I actually think it's a pretty good idea, and it will make the order tracking process much easier for me. I am willing to give it a go if more people tell me they're interested. The price would be a bit higher to cover the fee, the conversion rate from dollars to euros if necessary, and also because it requires a bit more work to setup the store and the product options. The only product option will be your os, Window or Mac. You will also get an activation key. @pierredemarque @Nednones what do you think about this? Hello Marcelo, is your robot in XML scripts? The screen shot looks like it is an XML format run in bot.binary. Sorrry I don't understand about python, maybe looks the same with XML? @MarceloPagnol I'm absolutely down with it. With that site and similar digital selling types you can just take the ease out of having to check if money has been sent and then send the files. Let me know if and when you are doing it? Cheers! @Nednones nice! Which os do you run, Mac or Windows? read all the comments, it looks real and profiting. As you said that you have spend around a year in developing it, did you done all type testing on this bot?....like trend, sideways, news events etc?.....will it gives the same consistent results? Please confirm me ....whats the high accurate time frames? can it gives $200 to $300 profit per day? if we set up the need configuration? Hi @MarceloPagnol, I use windows Server 2008 and 2012 as these are my VPS OS's. Mr Marcel, are u OK? No response, please send the robot to abt**[email protected] Payment has been made. Tq.